Love your chiropractic work, but don’t love getting adjusted every couple days? Chiropractors undoubtedly do some amazing work, having helped and continuing to help people with various issues around the globe; I am certainly one of them. My history as a chiropractic patient has shown me nothing but positive returns. When I walk out of her office, I feel like a million bucks. But one question I consistently asked myself was: why is it that sometimes the adjustments only hold for a day or two? Why do I revert back to how I was before the adjustment? This question opened up a door, behind which were only more questions. What causes my alignment to be off? Why do I need to get adjusted in the first place? And why do I have to visit once a week, sometimes even more frequently, to get the same work done? Midway through my college tenure, I contracted strep throat. While it was awful, it provided me with an invaluable insight that made all the weeks of agony completely worth it. Would it make the most sense for me to address only the symptoms, using lozenges for the sore throat, aspirin for the headache and fever, and ointment for the rash while waiting for the bacteria to run its course? Or would using only antibiotics be the more sensible approach, waiting for the cause to be addressed while I suffered from the symptoms? Neither! I was using both antibiotics to treat the bacterial cause while I used the aforementioned remedies to soothe the symptoms. If I focused only on the what, the symptoms of illness, the misalignment of the spine, and didn’t address why, why I had strep throat, why the vertebrae were aligned improperly, I would only get a portion of the picture. The next question I asked myself was, what is this why? Why is my structural alignment so, to be completely scientific, wonky? It was then that I began to realize that the main reason, the root cause, for misalignment is improper and unbalanced muscular function. The vertebrae of the spine are being constantly pulled on from multiple directions by numerous muscles. If the balance of muscular pull isn’t proper, and certain muscles are pulling more or less than they should, your spinal alignment can and will be thrown out of whack. When adjusted by a chiropractor, the vertebrae are nudged back into proper alignment. But, often, this is only a temporary patch. Why? Because if the root cause of improper alignment is not addressed – how well the muscles are functioning not only as individuals, but as a unit – then the longevity of your realignment could be in jeopardy. To be quite clear, this is not to discredit or devalue the work of my chiropractor, your chiropractor, or any chiropractor. But I began to wonder, asking myself if there was something else, some other component, any adjunct to my chiropractic care that could help my adjustments work better and hold for longer. I was introduced to a personal trainer. At first, when I heard personal trainer, I was doubtful. I didn’t want a beach body, I wanted to feel and move like I should have been able to as a 16 year-old athlete. But I decided to give it a shot, figuring that I had to start with some sort of muscular care to augment my chiropractor’s work. To my astonishment, he was not like any personal trainer I had previously known, but one who had a very specific and unique set of tools, the likes of which I had never before seen. He was a fitness professional unlike anyone I had ever met, a true muscle specialist. After working with this trainer, I realized I wanted to do for others what he had done for me. 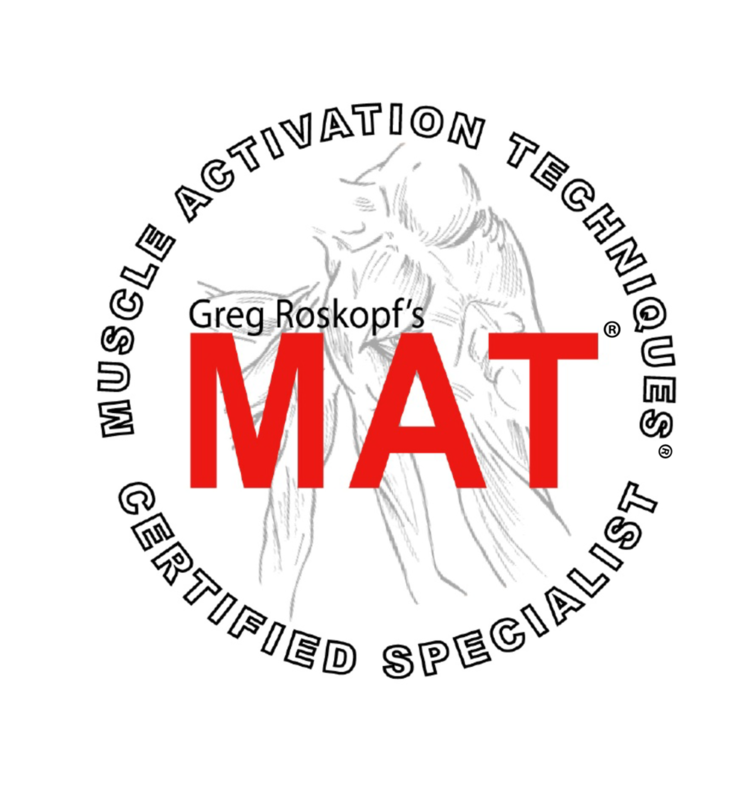 This muscular care came in the shape of completely personalized and appropriate exercise, entirely unique in its implementation, unique to me, my body, and my goals, combined with Muscle Activation Techniques (MAT). This care was focused on getting my muscular function back to a balanced condition, with a goal of reducing compensation and returning my musculoskeletal system to its optimal state. When my chiropractic adjustments were coupled with consistent and frequent application of this diligently attentive care for the muscular side of the equation, my adjustments not only began holding far longer, in some areas they even began holding indefinitely. In much the same way as antibiotics and symptom treatments work in conjunction with one another when you have an illness like strep throat, chiropractic adjustments can ease the symptoms of pain and discomfort that come with poor alignment while MAT and appropriate, personalized, unique exercise can deal with the root cause. Experience the perfect combination, focus on the what and the why! Reach out today and schedule your consultation!